Jardine Foods has been producing premium-quality Texas foods since 1979. To them, Southwestern flavors are not a trend, they are a way of life. They do it all in-house, from development to production, so every step of the way they make sure their products have the quality and taste we are proud of. The result is the very best Texas-style salsa's, sauces, and other fine foods, direct from the Jardine Foods family to you. 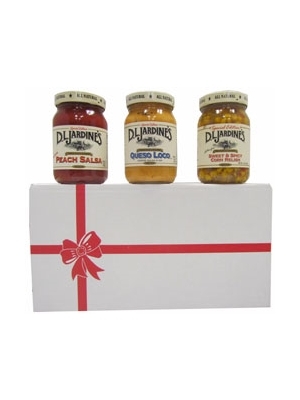 This gift set lets you select the three items you want us to include. Simply select the items below, add your personalized gift greeting and we will take it from there!